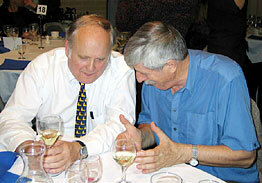 On July 11th 2004, over 300 biologists and paleontologists from more than 40 countries gathered in Perth, Australia for the World Congress of Malacology. Malacology is the study of molluscs (e.g., snails, clams, squid and octopus) and focuses on understanding one of the most diverse groups of organisms on earth. There are over 200,000 living species of molluscs and they range in size from giant squids over 20 meters in length to adult snails with body sizes of less than half a millimeter. They also exhibit a great variety of physiological, behavioral, and ecological adaptations and habitats, and have an excellent fossil record extending back some 560 million years. With so many lineages over such deep time, it is hard to imagine any topical biological or paleontological question that cannot be addressed with a molluscan exemplar or system, and the papers and posters at Perth did little to negate this assumption. brought together a remarkable group of scientists to present and discuss current hypotheses on the relationships and evolutionary history of the Mollusca. The three-day symposium featured 38 presentations and nine posters. Speakers were intentionally selected both to complement and to contrast different viewpoints, datasets, and methodologies. The organizers were not looking for consensus, but rather a critical review and status report of our understanding of the evolutionary history of this major branch on the Tree of Life.